I have been training search dogs for years. I am Canine Training Director for my search team and have trained wilderness air scent dogs, cadaver dogs and trailing dogs. All of the work is volunteer and we respond when we get called out by state and local police. Oftentimes we are second tier to police dogs and we are called out when they have not located the missing person, so the searches don’t happen as often as we would like. We have the luxury of lots of training and after searches we are able to go back to training to fix any issues that might happen in the real world. In training we have control over the hides (human remains or subjects). Generally either we or someone accompanying us know where the hides are and if the dog alerts elsewhere we don’t reinforce the behavior and if they alert correctly there is a big party. But when out on bed bug detection jobs, there is often no immediate feedback. My bed bug dog alerts and I treat or not. Later I may find out if there was in fact a source or hide, but the delay could be hours or days. And many working dogs work a number of jobs a day and on consecutive days so squeezing in corrective training can be difficult. I have three certified dogs; a live find dog, a cadaver dog and a bed bug dog. I find that handling my bed bug dog is the most challenging because of the aforementioned issues. If I reward her for a false alert (every working dog falses at times) then extinguishing that behavior will be more difficult. But if I don’t have immediate feedback on whether there are bed bugs or not, I can’t withhold the reward. If I am withholding rewards until I actually get visual confirmation my dog will stop alerting for me. In training you can watch your dog and observe her body language when she is sourcing a hide as well as when she is falsing. Get to know your dog. You know where you have put the hides (bed bugs) so if the dog falses, what is his body language? What are you doing to elicit the false? Tape your sessions or have an experienced person watch you. I have a group of handlers that I train with. They give me feedback and make suggestions. Regardless of how many years you’ve done this, feedback is always valuable, even from a less experienced person. It’s a fresh set of eyes. Single blinds (you don’t know where the hides are but another person who is present does) are valuable so you don’t unconsciously cue your dog. I just learned that my bed bug dog sometimes licks her lips when she’s made the find in addition to her sit alert. I also train to commit to scent so if she makes a find she stays seated with it, regardless of what I do. If I keep walking she stays. Another behavior is sourcing. When your dog comes into scent, generally she will spend time sniffing to find the exact location of the scent. That’s another behavioral indication of commitment to source (the bed bug in our case). I constantly work distractions. When we go out on inspections we run into distractions and challenges every time. Hopefully you’ve proofed your dog off of the many distractions but when you’re inspecting people’s homes and other facilities there is always a new challenge. Sometimes a scent can be close to the scent you work. Carpet beetles can be close to bed bug scent and I have gotten carpet beetles to proof off of with my dog. I also proof off of dead bed bugs as we do lots of post treatment inspections and there are generally dead bed bugs. We don’t care about dead bed bugs and I can’t have my dog alerting on them, we only care about live bed bugs. So my dog knows there is no reward for dead bed bugs. I reinforce that training periodically with her so she doesn’t forget. Having a certified dog doesn’t mean you’ve arrived. I’ve had search people tell me that their dog has never falsed. I always wonder how they know that unless they have never been on a real search and they have always known the location of the hide. But that’s not real life. I have also had bed bug handlers tell me they only reward their dog when they get visual confirmation. But we bed bug dog handlers know that we are only called in when there are all the signs (bites) but our clients can’t find the bed bugs. We also oftentimes can’t get visual confirmation after an alert. The dogs’ noses are sensitive and they are able to find a hidden bed bug in a location that is impossible to see (between floor boards for example). I’ve asked those handlers how often they get visual confirmation and they say ‘not very often’. I have to wonder if their dogs are always telling them about their finds. Why bother if there is no reward? One thing I’ve discovered as a Bed Bug Dog Handler is that bed bugs are never where you expect them to be. You cannot anticipate where they will be. So given that, it’s essential to believe what your dog tells you. If he alerts, he smells bed bugs and no alerts, no bed bug scent. Trust your bed bug dog. I have gone out to houses with people who have many ‘bites’ in the right locations – hands, wrists, ankles, face sometimes back, all the exposed areas. My dog will not alert on any scent. Sometimes these people have travelled and the only explanation is a delayed reaction or getting bitten elsewhere (office, etc). And after our visit they won’t get any new bites so I do trust what my dog said: ‘no bed bugs’. Another inspection the woman was waking up to new ‘bites’ at night. She had just begun a job as a home care worker and went into a variety of patient homes. Prime candidate for bed bugs! I have to say that I went expecting to find bed bugs. No scent according to my dog. They had taken care of a dog the previous week and I suggested other alternatives. I’ve also had hives and they can be itchy and fleeting. I always do a follow up with my clients to see how they are doing. It’s good feedback for our work. I called her nine days later (bed bugs feed every 5-7 days so it would give them time to feed again if present). She had not had a ‘bite’ since the night before we came out and the doctors now thought it might be hives. I know our inspection allowed her to sleep better. We have gone out on countless post treatment inspections where the client felt ‘itchy’ and found no bed bugs and it gave the client piece of mind. One post treatment inspection I expected to find bed bugs. The tenant said she had seen bed bugs recently and was getting bitten. It had been 90 days since the heat treatment and they had a large infestation. They unsuccessfully chemical treated first for eight months then resorted to heat when that was not successful. This time she said she ‘wanted heat again’ and that her bed bug bites were sporadic. I expected to find bed bugs. My bed bug dog found no bed bug scent. The tenant was not happy. I also inspected the other two upstairs apartments where the tenants said they had no bites or visual confirmations and we likewise found nothing. I instructed the woman to take a picture of the bed bug next time she finds one and send it to us for confirmation. I think her ‘itchy’ feeling had escalated to the point where she got confused about the timing of seeing bed bugs before or after treatment. I recently went out to a sorority house where the house manager thought the house mate was psychosomatic. She had received bites but no one else had. Not all people react to bites so her roommate might not react. We had had five inspections in a row with no bed bugs. We inspected the fourth floor rooms and found nothing. On the third floor my dog alerted on the clothing bins under her and her roommates raised beds. My dog was adamant with a little pawing (she has a sit alert and only paws if I’m not listening to her and she wants to make sure I hear her). There was one other room on the same floor where I got an alert. It was a room where the roommates also sometimes sleep. Nothing in the rest of the house. Bed Bug Dog trainers and handlers, or any detection dog trainer/handler for that matter, must trust their dogs to be effective. And the way to build trust with your dog is to have your dog prove that he is reliable and to get to know your dog’s body language. Ongoing training is the basis of maintaining a reliable bed bug dog. Watch your dog in training and get to know his body language when he’s in scent and when he’s made a find. If you have been out on a number of searches with bed bugs in the bed your dog will start expecting there to be bed bugs in the beds. Be sure to train in between these inspections on beds that have no bed bugs. Set your dog up for success. If I’m doing inspections every day I set up training early in the morning or late at night. It’s easy motivational training but it just reinforces the scent and proofs the dog off any expectations of a find. If you watch a bed bug detection dog work, what you want to see is the dog thoroughly checking low, nose level and high as he moves along. Oftentimes a handler will work with the dog on the left side and move clockwise around the room in a pattern. You don’t want to see the handler walk into the middle of the room with the dog and walk out. That is not detailing a room. That’s air scenting and that isn’t sufficient in searching for bed bugs. Once you’ve gone around the outside of the room the handlers often go around each inside object in a counterclockwise direction. Why is detailing essential with Bed Bugs? Bed bugs have a very small scent cone – approximately six inches. A good bed bug dog will pick up the scent when moving into the room from a greater distance if the air flow is moving the scent around but that cannot be relied upon. A larger infestation is easier to pick up. But if you just came home from a trip and a bed bug or two hopped into your luggage, a dog cannot walk in and out of the room and pick up on that odor. The more thoroughly your bed bug dog details the room, the better you should be able to sleep at night. It takes longer and is harder work for the dog and handler, but it’s essential to do a thorough bed bug search. Some services want to cruise in and out of a facility, but that isn’t what you want to hire for a bed bug detection dog service. How can you tell up front if a Bed Bug Dog service is thorough and reliable? To start out, make sure that they are certified. The bed bug detection dog and handler team have to test annually in order to be certified. Also, if they say they are certified, ask them what date they certified. It is essential to retest annually and if it’s been more than a year, they are no longer certified. Ask your perspective service to run a test for you. Ask them to bring a vial of bed bugs they use for training or of pseudo scent which is the scent of bed bugs but not the real thing. Ask if you can hide it in the room somewhere and have the dog search for the vial. You may have to wait 30 mins after hiding so the scent cone is available to the dog. You also want to hide it in a location that the scent is available to the dog since there is only a tiny opening at the top of the vial. All you are trying to determine is if the dog can recognize and indicate on that scent. 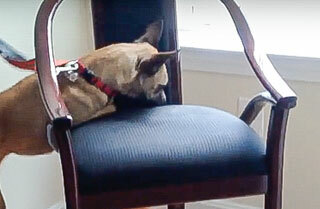 If the dog cannot find the vial, then you probably want to stop any search and find another Bed Bug Dog service. We at Bed Bug Detection K9s are currently working a large job with 200 units. The previous Bed Bug Detection Dog service that they had retained walked into and out of each room without detailing. Immediately after the inspection they found a huge infestation of bed bugs in a unit. A huge infestation doesn’t happen overnight. The handler also refused to do the vial test prior to the search and was not certified. MANY RED FLAGS!!!!! We are splitting the search into three days with days of recovery in between. A dog cannot do more than that if they are doing thorough detailing. If you are a property manager and have many unit buildings, you will want the dogs to be fresh and effective. One dog cannot do 100 units in a day and be effective. Some services bring in several dogs and swap them out and that is a reasonable approach if the job needs to be done in short time. Otherwise spread it out. At Bed Bug Detection K9s we take breaks with the dogs. Fifteen minutes is enough to revitalize the dog and get them refocused. I like to stop after 70 units. Any more is too much detailing for my dog for one day. I can see if my dog is not focusing, or if I question an alert, I take a break and come back and re-inspect the unit. When my dog needs a break she doesn’t slow down, instead she needs to be recast because I see she is missing areas. Recasting in circling around to pass through the area again. She also might do a false alert. If she is tired and does an alert without sourcing the bed bug, it’s time for a break. Sourcing the bed bug means change in body language. She will breathe more heavily, her tail might move, she might do a button hole turn and go back to a previous area. That is all indication to me that she has found something and is working odor. The alert (behavior that tells the handler she has found – it might be a sit or a scratch or nose touch) is just the final commitment. So if a dog false alerts (tells you she has found without there being any bed bugs) with no body changes then it needs to be questioned by the handler. A good Bed Bug Detection team will train minimally 16 hours per month. If a team hasn’t bothered to certify I truly doubt that they are keeping up with their training. Training logs are a part of the requirement and any professional service will have training logs on hand in the event they are ever called into court. It’s reasonable to ask a service about their training logs. I am the owner and dog trainer/handler at Bed Bug Detection K9s. I also have two dogs that are certified in finding missing people and they are used by the state and local police. I follow the same high standards on working my bed bug dog that I do on my live find and cadaver dogs. Professionalism, reliability and accuracy are essential with any working dog and the client deserves to get what they pay for.